Climate change will be the defining issue of my generation. 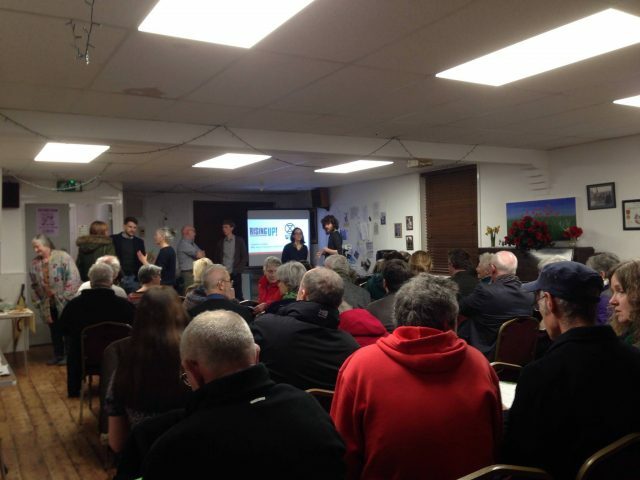 Thus, it was personally very pleasing to see seventy people turn out at the Extinction Rebellion meeting in Wivenhoe on Friday 22nd March. People are simply no longer willing to accept the little tinkering around the edges that our leaders call ‘tackling climate change’. Over the last few months, we have seen a rapid rise of people standing up and showing the government that they are not doing enough. Youth Strike for Climate Change has been inspiring. As a student myself I have been involved in this, and we have brought the Strike to Colchester in recent weeks. Young people clearly recognise the need for more drastic action. Extinction Rebellion has also begun campaigning in Colchester. On 9th March a funeral procession was held in Colchester to mark the start of Extinction Rebellion Colchester with three-hundred people present. Here in Wivenhoe, we are part of XR Colchester and the meeting on 22nd March was essentially the launch of XR in Wivenhoe. For the first half of the meeting the guest speaker spoke about ‘how we got here’. Taking us through the facts and the science of climate change. During this first part of the talk, it seemed as though it was trying to convince a group of converts that climate change is a threat. But, for the second part ‘what we are doing about it’ it flipped to a presentation for the dedicated activist. The science was sound, explaining that in the last thirty years, emissions have increased by 60% and that the IPCC target of 2℃ is simply not ambitious enough. Moreover, the speaker drew on a wide range of established, globally respected, climate scientists (such as Professor Kevin Anderson) and UN reports. Perhaps one of the most important scientific aspects of the talk was on the Albedo Effect. This is an example of a feedback loop, meaning that as temperatures rise the arctic ice melts reflective white ice disappears and is replaced by absorbing dark ocean which in turn merely takes in more heat and the process continues to spiral. The speaker also spoke about the dangers of ocean acidification and the threat of reaching a ‘tipping point’ that we would not be able to fully recover from. They described climate change as the sixth ‘extinction event’. The risk of this was categorised as dangerous if temperatures rise by 1.5℃, catastrophic if they rise by 3℃ by 2050, and unknown but beyond catastrophic if they rise above 5℃. Although lots of data was presented to show proof of global warming and climate change, the underlying reasons were left ignored. The cause of a massive rise in carbon emissions since 1800 was not discussed. It is clear that this massive rise in carbon emissions coincides with the industrial revolution and the onset of industrial capitalism. Thus, it is obvious that industrialisation has been a massive contributor to climate change. Moreover, the nature of capitalism makes it innately reliant on permanent consumption; ‘consumer culture’. Without addressing the root cause of the issue we will never be able to fully solve it. The second part of the talk ‘what are we doing about it?’ The main strategy of Extinction Rebellion is non-violent-direct-action (NVDA). Extinction Rebellion doesn’t believe that everyone needs to become a convert, in fact, the speaker spoke about how only around 3% of the population had to be actively involved for social movements to be successful in general. Moreover, the goals of NVDA were also set as; causing disruption to everyday life, self-sacrifice to the cause, and engineering the situation to backfire on the authorities. NVDA has been a highly effective strategy all over the world for creating change, and the points made about its aims were correct; nonetheless, the organisers needed to remember this was an introductory meeting and this talk should have focused more on the general actions that the audience might take. Indeed, the speaker now moved onto being arrested, talking about the practicalities and how pleasant the conditions are. There was a tangible feeling of tension in the room during this part of the talk. Many people were clearly taken-a-back by the talk of being arrested and self-sacrifice. There is a danger that people get put off by this at the introduction stage. NVDA can be mentioned at the introduction talk, but details and talk of sacrifice and prison should be kept for NVDA training days and the more dedicated activists. Local, national and international activism on the issue of climate change is absolutely vital. Extinction Rebellion is a vehicle for this. They have already been active in the UK, US, Germany, South Africa, Italy, France, Australia, New Zealand, Belgium, Switzerland, Canada, Netherlands, Denmark and Norway. April will mark the beginning Extinction Rebellion’s international rebellion with coordinated action in a number of capital cities across the world. The choice is clear. We cannot afford to carry ‘business as usual’, the future of human civilisation is at stake. But, in order to achieve lasting change, we must address the fundamental causes of the disaster. Capitalism and its inbuilt consumer culture have driven humanity to the edge of an abyss. We are teetering on the edge, fail to act and we’ll fall in.